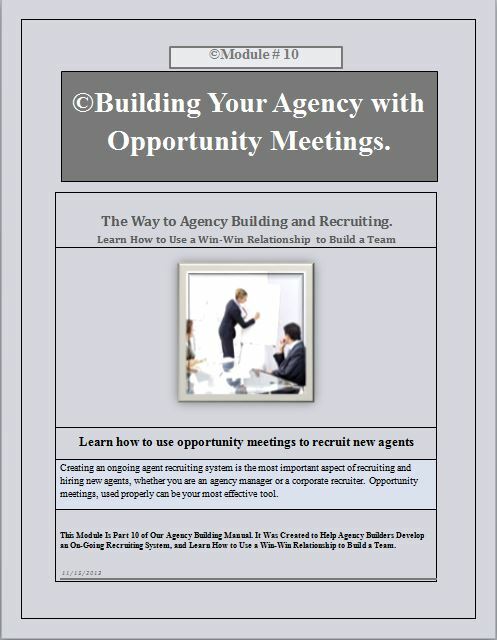 Insurance agents recruiting using opportunity meetings. It is a powerful recruiting system. Just like it sounds. It is a predetermined date/time and location that is set up on a regular monthly basis whereby you and your agents invite people to come to and hear about your agency opportunity. It should be your number 1 recruiting system. The objective of an opportunity meeting is to present your insurance career opportunity to those people, who you or your associates invited. It allows you to consolidate your recruiting activity so as to save you time and energy. You can tell the same story to 7 or 8 people rather than doing it one on one. It also creates a form of team leadership and camaraderie. And then you have a choice or pool of people to choose from. We have created this unique 10 page e-book module that explains how to use this concept. It is the complete system. It provides the scripted talks that you use to invite people to these meetings. Most importantly, it will also teach you and your agents how to bring quality people to these meetings. We also include an opportunity meeting agenda example for you to use. There is nothing on the internet like this. it is the same format that i used to build a 150 person agency in 7 years. It makes recruiting easy and exciting. You can get your own opportunity meeting e-book manual today. No waiting. See order link below. It is part 10 of our complete agency building system. The opportunity meeting concept first and foremost a system. This opportunity meeting concept is only one part of how to build an insurance agency that an agency manager or corporate recruiter needs to implement if they want to generate ongoing recruiting activity. Using these preset monthly recruiting/opportunity meetings are what you use to bring new people in to listen to your career opportunity. Opportunity meetings also provide a way for you to develop a reserve of potential new recruits. insurance agent recruiting, done properly will reap quality agents, but it takes patience and practice.